I want to thank Daily Candy for their feature on my work and commissions yesterday. It was an honor to be published by them! I also want to say thanks to Washington, D.C. Editor, Annie Lou Bayley Berman, who wrote the piece. She couldn't have been nicer when she interviewed me! 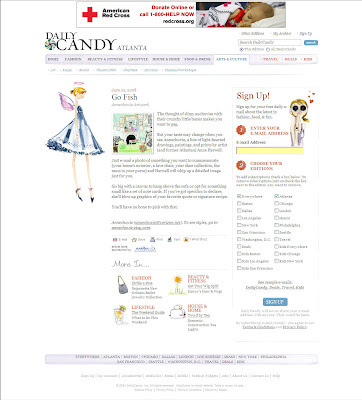 As many of you know, Daily Candy is a sort of hip newsletter sent out to scores of subscribers across the country and abroad (NYC, London, L.A., D.C., Miami, Dallas, San Francisco, Chicago, Boston, Atlanta, Philly, Seattle) that features tips, leads and deals for the latest and greatest in shopping, the arts, events, restaurants and unique services. You can sign up for free for any city or even receive them all! Daily Candy will put you in the know! In "Annie Lou Bayley Berman", "Atlanta", "Daily Candy"